Most of you know that it is ballet competition season. If you are brand new to competitions, we understand how daunting it can be to purchase a costume for your dancer. We hope the information that we provide in this series of blogs will ease stress that you may have during the costume creation and ordering process. Each month, Tutu Etoile will provide information on a different ballet that is listed in most all competition repertory. We are sponsors for American Dance Competition. For ours purpose, we will use ADC’s Classical Repertory list. Provided here: Additional lists to YAGP (Youth America Grande Prix) and IBC (International Ballet Competition) are provided in the link as well. 1Set along the border of Galicia, an Eastern European area ruled by Hungary from 1870 – 1887 is the ballet, Coppelia. Also known as, The Girl With the Enamel Eyes, Coppelia is a sweet story of a girl named Swanhilda who loves a boy that falls in love with Coppelia. But, there is a further twist to Frantz’ love for Coppelia, as he does not know that she is a mechanical doll. While walking home, Swanhilda and her friends find a key just beside the door to Coppelius’ toyshop. Curiosity gets the better of the girls and they enter the shop. The girls find that the shop is full of mechanical toys that they set off one by one. Curious about the girl in the window, Swanhilda draws back the curtain to find that she too is merely a mechanical doll. Coppelius storms in to the room nearly capturing the girls as they escape except for Swanhilda who hides behind the curtain eager to get revenge on Frantz. Meanwhile, Frantz enters a window of the toyshop using a ladder and is caught by Coppelius who asks him why he has broken in to his house. Frantz then professes his love for Coppelia. Amused by this, Coppelius offers Frantz a never-ending glass of wine and Frantz falls asleep. Long contemplating what the doll would be like if he were to use magic to bring Coppelia to life, he casts a spell transferring Frantz life-energy to the doll. Unbenounced to Coppelius however, the life that is in the doll is actually Swanhilda in Coppelia’s costume. Exacting her revenge, Swanhilda wreaks havoc in the toyshop dancing and running a Moor Doll through with a sword. As she tries to do the same to Frantz she is forced by Coppelius back in to her chair. Frantz awakes and he is forced to leave down the ladder. As the toyshop settles, Coppelius gazes out the window and notices Frantz arm in arm with Swanhilda. Puzzled by all of the foolery, Coppelius faints, as some of the mechanical dolls seem to mock his misfortune. The final act takes place on a lawn of a manor where people have gathered to attend the marriages of several couples. Swanhilda and Frantz look past their differences and join the couples to be wed. This synopsis has been paraphrased of course, but it displays an overview of the story line of this sweet romantic comedy. 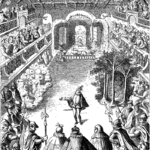 Coppelia, was first performed at Theatre Imperial de l’ Opera, Paris on May, 1870. The first dancer that the Choreographer had hoped to be cast for the roll of Swanhilda was Leontine Beaugrand. Beaugrand, was a very young unknown who the director of the opera felt did not posses the fame to sell tickets. Therefore, he cast Mlle. Grantsova, a star from Russia. But, due to rehearsals taking three years, Grantsova was not able to perform because she had previous engagements. Grantsova’s replacement was a young company dancer, Guiseppina Bozacchi. The ballet opened to great fanfare and succsessfully running but abruptly closed at the start of the Franco-German War. Unfortunately, Guiseppina died of fever soon afterward. 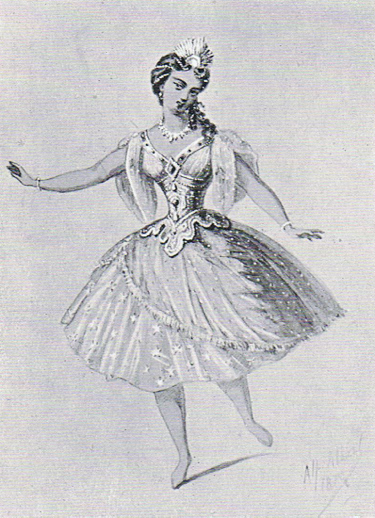 In October 1871, the ballet was presented again and finally Beaugrand performed the role of Swanhilda. The 1870 version of Coppelia is known as the first full-length ballet to use folk or national dance (Czardas and Mazurka). The use of folk dance in story ballets is the most continued of traditions to this day. The male roll of Frantz was a secondary roll to Swanhilda at this time. Thus the roll of Frantz was performed by Eugenie Fiochre (a woman). During the Romantic era, performing the male roll by women was commonplace. As Frantz’ roll became more prominent over time, so did the variations and Pas de Deux. The wedding scene in the third act developed and has become a popular scene to perform among the competition circuit. However, the wedding scene in the third act can be quite extravagant. This is where the dancer really shines in performance. 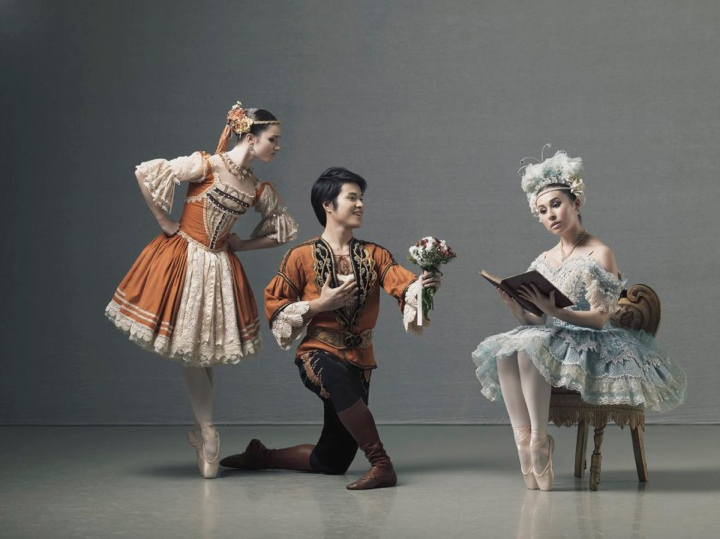 All variations of the third act as well as Pas de Deux are performed between the two characters. The costumes can be a myriad of styles depending upon personal preferences and your director’s requests. The tradition colors of the wedding scene are white/ Ivory with silver or gold embellishment. Tutu Etoile has had Swanhilda’s wedding tutu ordered as a Classical, Bell or Romantic. When ordering the costume, consideration should be made if the female dancer will be dancing a solo or Pas de Deux, as a younger set of dancers may not have enough skill to work with a hooped Classical Tutu. Frantz’ costume is traditionally a Tunic or vest with a softer sleeve and matching tights. Along with the requirements of the variations that your dancer will be performing, we take care to assist in smoothly developing a design that compliments your vision with consideration to your performance deadline and budgetary goals. Please view our Portfolio for examples.